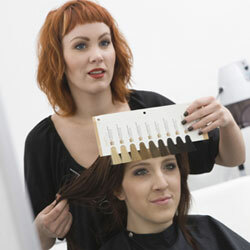 The consultation will allow our stylist to personally discuss with our guests all of there hair needs. We as hair artists want to fulfill and customize your hair weather it is with a Designer Cut or with Creative Color Design or more. We will customize our guests hair design according to your Facial Features, Body Structure, Hair Texture, and there daily life style. It is also important to create a personal home maintenance program so our guests can have a successful experience with there styling needs. All consultations are complimentary.